It’s not only inside that lighting is important, we also need to light the exterior areas and for that we bring some incredible outdoor lighting ideas for you to add to your moodboard! Sometimes we end up forgetting to give some light to our outdoor spaces. So that never happens to you again, here you have some ideas of how you can light up your exterior areas with an effortless look. 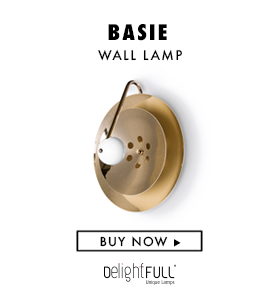 In this case, we present you a simple and classy wall lamp that completely blends in with the hallway style. Here we can see a magnificent house with some simple yet sophisticated wall lamps by the Portuguese design brand DelightFULL. The gold lamps give a unique warmth look to this enormous concrete household. Instead of having some big glamorous lamps, you can also look for discrete ways to illuminate outdoor spaces. LED bands are a very useful example because they can be hidden under stairs, furniture pieces or even balcony handrails. For a creative environment, you can adopt some “out-of-the-box” lighting designs, as the Graphic Collection by DelightFULL. Depending on the style adopted for the area, you can also use more traditional lighting systems, like this beautifully carved Moroccan lanterns. This teardrop shaped LED lamps are perfect to light roadways. Similar to the previous ones, this Moonlight Globes can be used to light water environments, since they’re waterproof and have the great advantage of being environmentally friendly. On this stunning Scandinavian porch, we can see some red industrial wall lamps that go together amazingly with the overall look of the room. You can also choose to light your outdoor areas with the use solar power, as you can see above. Solar powered lanterns come in all sizes and shapes and allow you to give some ambience to your exterior spaces. If you want to give a romantic appeal to outdoor spaces, there are some options for you in the market, like these Stone Eggs by VivaTerra. Overall, the electric lamps like the ones you saw by DelightFULL will give you brigther spaces but it’s good for you to know that there are many options for you to consider!